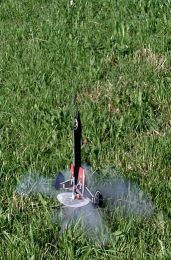 The Stingray from Fliskits is yet another innovative design from one of the leaders in model rocketry today (my opinion). It is a challenging level 3 build but is well worth the effort. Fliskits was one company asked to create a commemorative kit to help celebrate NSL 2004, and what a kit it is! I purchased my Stingray direct from Fliskits, it was numbered #27. Free NSL 2004 wrap kits are included for the first 100 sold. I also purchased a Maelstrom wrap kit because it just looked too cool to pass up. My kits arrived in perfect condition and contained the usual FlisKits high quality parts. The instructions are superb. You start assembly with the 18mm motor mount, no surprises there. The instructions say to tie the Kevlar® shock cord around the motor mount which I feel is a much better method then the standard Estes tri-fold mount. Once the motor mount is installed in the BT, the instructions tell you to stop and go to the wrap section. The NSL wrap set does include a BT wrap sheet, however, the Maelstrom kit does not. The BT will be painted black later on. Next, you cut out the four fins from the balsa fin stock. Two of the fins are your standard trapezoid shape used as wings. The two fin tips are curved so you must take your time in cutting these out. I cut mine a little oversized and used sandpaper to perfect the shape. Then you cut out the bulkheads from the 1/16" balsa stock. These were also a challenge to cut because not only is the balsa thin (although good quality), but they must fit around the engine mount which protrudes from the BT. You must cut semi-circles in each bulkhead half plus cut a notch for the engine hook. After you cut out the two halves, you must then cut the bulkheads in half so you end up with 4 pieces. I test fit my bulkheads on the engine mount before cutting them in half. I used a Dremel fitted with a drum sander to form a good fit around the engine tube. The wing assembly comes next. You take one of the wings and attach the two quarters of the bulkheads to either side of the root edge of the wing so the wing is at 90 degrees to the two bulkhead pieces. You do the same for the other wing. Once wing assembly is completed, you are again referred to the wrap section. I ran into some minor problems with my Maelstrom wrap. The fin wraps are printed on crack and peel decal paper that must be cut out before applying. Unfortunately, the crack and peel does not always work and in my case, bending the paper to crack the backing left noticeable white lines on the black wing and fin tip wraps. Also, the ink seemed all to willing to peel and was easily scratched off, even by the metal ruler I used to cut out the wraps. What I would recommend is to coat the wrap paper with a couple coats of Krylon Clear Coat (it was too late for this build). I tested this on leftover scraps of the decal paper and it both worked and looked great! Once I had wrapped the wings and the fin tips, I used a black Sharpie marker to color in the exposed balsa on all exposed edges. I then coated all edges with white glue to seal both the marker ink and the edges of the wraps. One thing that seemed to be missing from the instructions was any mention of the wraps for the bulkheads. I cut my bulkhead wraps into four pieces and placed them on the individual bulkhead pieces before mounting the wings to the body tube. The next step is to mount the wings to the BT. If you cut everything correctly, the root edge of the wing will lie flush with the BT and the bulkheads will line up over the engine tube. I needed to sand a bit off the right wing to get the root edge to lie flat. The bulkheads were almost perfectly lined up with about a 1/16" gap between the two halves which form a V shape over the engine tube. After the paint had dried, I put glue inside the lines I drew earlier. After you lay down the glue, you put the shroud back onto the kit and let it dry. The shroud surrounding the bulkheads tended to want to separate a bit, so I placed a light weight on top the model to keep the shroud pressed against the bulkhead while drying. I added white glue fillets to all the joints for added strength and to improve the appearance. I also touched up any exposed balsa with a Black Sharpie. My shroud had a 1/8" overhang in the rear, but the instructions show this area to be flush. I decided not to trim the shroud because I thought the overhang looked pretty cool, kind of a 3D effect. I then glued on the fin tips and added fillets to the joints for strength. All that remained was to build, mount, and paint were the two gun assemblies and launch lug with standoff. I hand painted my gun and lug assemblies before attaching them to the body tube. I masked off the wings to protect the wraps and also put Testors thin masking tape on the three areas where the guns would mount and where the launch lug attaches. I cut the masking tape to size to exactly match the size of the gun and lug mounts. I also carefully masked off the areas inside the lines I traced around the shroud so that the shroud would be able to adhere to the unfinished body tube and not to the paint. The balsa nose cone was given two coats of sanding sealer with a light sanding in between coats. Two coats of Krylon grey primer on both the nose cone and body tube and then two coats K brand (German) black metal flake auto touch up paint. Although the auto paint is more expensive, it goes on thick, it is fast drying and gives a rock hard finish that can take a lot of abuse. 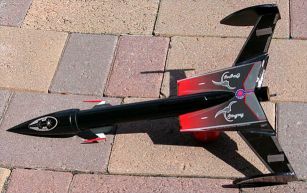 Once I had fully assembled the rocket, I gave the whole assembly 2 coats of K Brand Clear Coat. Launch day was almost perfect, with a 5-10 mph wind. I added three sheets of wadding to the BT and inserted the parachute. I always get nervous launching rockets that I spend a lot of time building, so first flight was with a "safe" A8-3. The Stingray really took off fast, weather cocked a bit into the wind and flew to about 250 feet. Ejection occurred just after apogee and she quickly floated down for a safe landing. Looks great going up and coming down. Second flight was with the next recommended motor, B4-2. She weathercocked a bit more this time, and had another perfect recovery. Last flight was with a B6-4. I would estimate about 420 feet on this flight, and a experienced a lot more weather cocking. I must have over packed the wadding because the parachute did not fully deploy. Fortunately, I launch in tall grass and it had a fairly soft landing. I did lose one of the gun mounts--easily replaced since FlisKits always includes plenty of extra balsa in their kits. Plenty of shock cord, the Kevlar® can take some punishment and it helps to protect the elastic. What can I say? I am hooked on FlisKits! This is yet another example of a superbly designed kit with plenty of attention to detail. I would love to see the crack and peel wrap sheets go away and I would suggest using a stronger ink on the Maelstrom wrap kit so it does not scratch quite so easily. Thank you for the wonderful reviews. I had heard about the launch lug issue and will be correcting that. This *is* a challenging model to build and I am happy to see that folks are excited by the challenge rather than put off by it. There are many parts that have to be cut, aligned and assembled to create the overall kit and tolerance build up can cause issues, but nothing that a bit of filler can't fix. As for the nose cone with the transition near the end, we didn't call that out as is isn't a part of the assembly and we designed that into the look of the kit. Happy flying! Anyone wishing to follow the progress of the Stingray I reviewed, through photos and videos, in terms for construction, flights and repairs is welcome to look here.